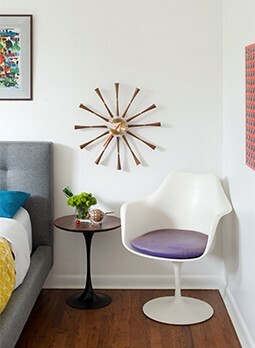 While the condo is a bit more laid back and fun, the houses share a refined aesthetic and a edict against clutter, a mod must. When a rosewood credenza at the Palm Springs pad got the couple interested in other pieces made of the wood, that material also jumped to L.A. in the form of a custom dining table. “The only real similarity in my mind is both homes are post and beam, and both have amazing vistas,” Langford muses. “From a finish perspective, they feel different. 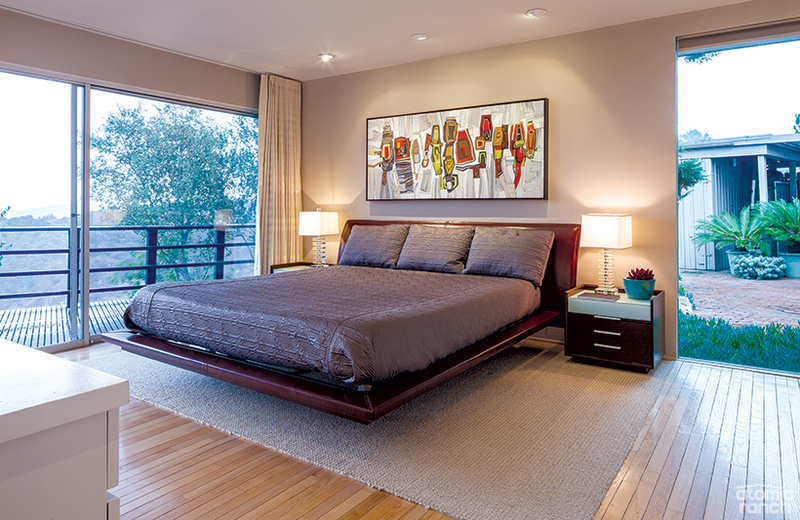 The master bedroom platform bed and nightstands are from a since-shuttered furniture store, while the ‘Atomic Essex’ painting has sold to a collector.